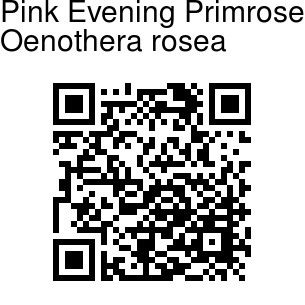 Pink Evening Primrose is an interesting wild-flower native to Central and South America. 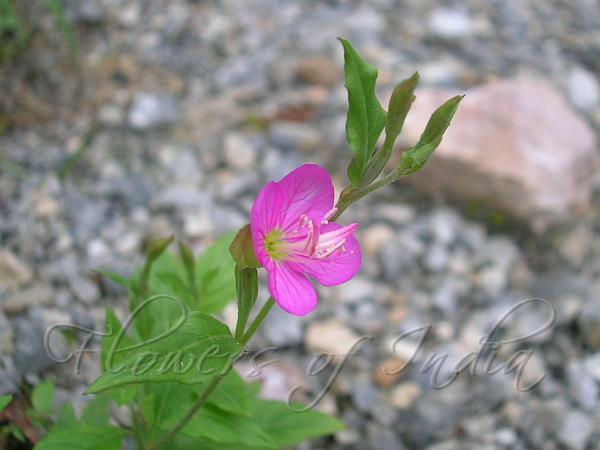 However, it is widely naturalized in India, and can be seen growing wild high in the Himalayas. It is a well-branched perennial herb, flowering the first year, with stems 10-40 cm tall, densely bristly. Leaves are nearly entire or somewhat cut, elliptic or rarely narrowly ovate, 2-5 x 1-2.5 cm. Leaf stalk is 0.2-2.5 cm long. Flowers open near sunrise. Mature buds are erect. Flower tube is 4-8 mm long. Sepals are 7-12 mm long. The four petals are rose to rose-purple in color, inverted-egg shaped, 4-12 mm long. Style is 0.8-1.4 cm long, the stigma surrounded by the anthers. Capsule is club-shaped, 1.3-3 cm long, tapering to a sterile portion 0.5-2 cm long. Flowering: April-September. Photographed on McLeodganj-Triund route, Himachal Pradesh.